Did you know that it is National Mushroom Month? 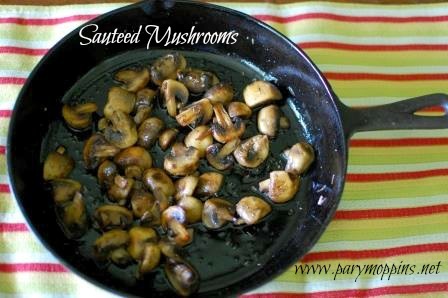 But as a tribute to those fungis* (get it, fun guys...moving on...) I thought I would share one of my favorite quick and versatile side dishes - sauteed mushrooms. These earthy beauties can be thrown into a vegetarian dish to make it heartier - an omelet, salad, or pasta perhaps. As simple side dish for steak, they shine. Mixed with meat, like in burgers or meatsauce, they boost the flavor and health factors. The English have them with breakfast and I like them on toast for a healthy and filling lunch. This goes pretty fast (5 or 6 minutes cooking time) so make sure everything is handy. Wipe the mushrooms with a cloth or paper towels to remove any dirt clumps. 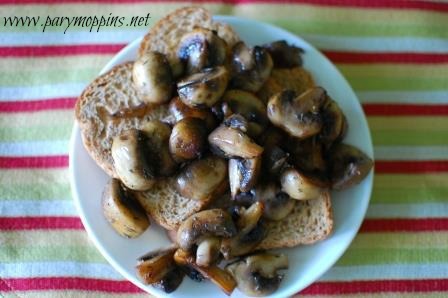 Depending on the size of your mushrooms, you can slice them or leave them whole. Just make sure they are all roughly the same size so they cook evenly. I like to halve or quarter them. Go once and a half around your skillet with olive oil. Heat the oil on medium and throw in the mushrooms, a sprinkle of salt, and a couple of springs (or a teaspoon) of thyme. Stir to make sure the mushrooms are all coated with oil and in one layer. Give the pan a shake or a stir every now and then to keep the mushrooms moving so they don't scorch or soak up all of the oil. Once the shrooms look a little wilty, sprinkle a little pepper over the top and give them another good stir. If you want to learn more about mushrooms, you can visit the Fresh Mushrooms website. Yes, I realize that "fungis" is not a word and that the plural is fungi or funguses but I couldn't pass on the pun. I am a member of the One2One Network and will be entered into a drawing for shouting the praises of the mighty mushroom. In my opinion thyme and mushrooms are best friends! I really do want to scarf down the whole pan. Oh absolutely Ms. Michelle! Thyme and rosemary are my go to herbs. They both marry with earthy flavors like potatoes, sweet potatoes, and mushrooms so well. Thanks for linking up this week. Good to have you! I love mushrooms! And thyme is my favorite herb! I recently discovered that cream of mushroom soup is pretty easy to make from scratch. We love mushrooms and your Sauteed Mushrooms look delicious. Thank you so much for sharing with Full Plate Thursday and have a great weekend! Thank you Miz Helen. I love versatility and mushrooms have that in spades!